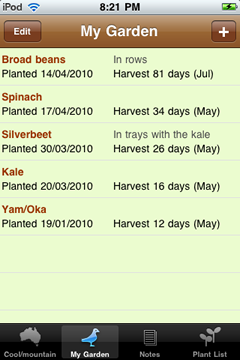 Want a fully portable version of Gardenate with extra features like your own planting and harvest calendar? Try our app, available from iTunes, and now available on Android Market and Nokia Ovi . The Android/Nokia versions don't yet have the Notes page shown in the iPhone version, but I'm working to add any missing features as soon as possible! 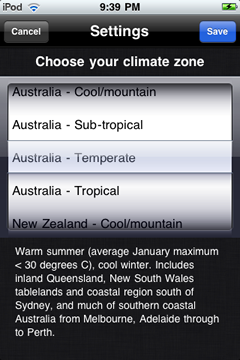 The Gardenate app puts our vegie gardening database in your pocket, localized to your climate zone. It lists the best choices for planting right now, to keep your garden productive and thriving. 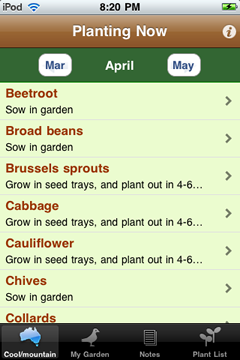 Packed full of advice on getting the best from each crop, it gives you a monthly planting calendar ready in your pocket. Connect from within the app to read and post comments and tips from the Gardenate community. 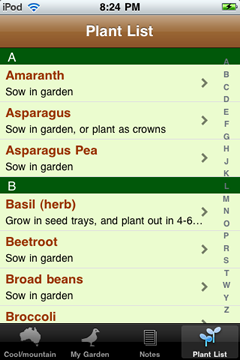 Tap a plant to view detailed planting advice, and..
tap Comments/Tips to connect with the Gardenate community online and read the comments and tips. Read the advice from others, ask a question, or post a new tip. Flip to the plant list tab to see the full list of plants for your planting zone - start planning your gardening for the rest of the year! 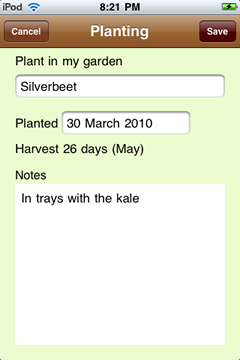 Record your planting details in the 'My Garden' tab. Press the [+] button to add a new plant to your garden. Press [Edit] to delete old notes. 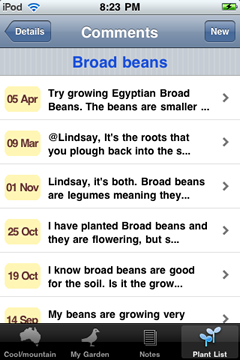 Add your notes to 'My Garden'. 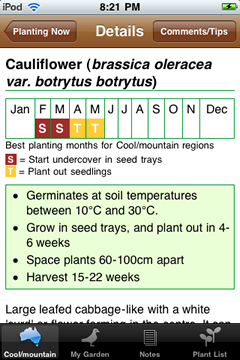 Set the planting date and see the estimated harvest date. 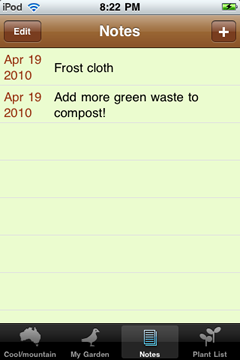 The 'Notes' tab is a general notebook and 'todo' list to keep your garden ideas always at hand. Press the [+] button to add a new note. Press [Edit] to delete old notes. If you have any questions, comments, or suggestions, please email us at [email protected], or use our contact form. We welcome your feedback and look forward to hearing from you.